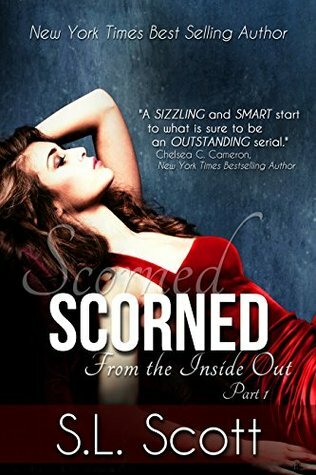 SCORNED is a gripping story of heartbreak, lost love, pain, regret and possible new beginnings. I devoured this book! I was sucked in by all it’s emotional brilliance. It’s intriguing and intense. It’s a great start to this new serial. It’s sets you up perfectly. Giving you just enough but leaving you needing more!! Three years ago, Jules lost the love of her life, Dylan. He just packed up his stuff and left without a valid explanation. Leaving her totally devastated. She has been a shell of a person ever since. Feeling nothing. Completely numb. This book was so excellently written that I felt all her pain and hatred for Dylan. It was palpable. I actually wanted to punch him in the face! But you know what they say, there is a fine line between love and hate. Anyone who has endured a broken heart can relate to this book. It is emotionally draining, but oh sooooo good!!! Jules takes a leap of faith and finally decides to open up and let someone new in, Austin. He is a great guy. That seems to have every thing going for him. He makes her feel safe and cherished. Feelings of happiness and hope start to resurface. Can she finally let go of the past and find true happiness and again?? Meanwhile, Dylan has been struggling with his decision for the past three years. Immediately realizing he made a mistake. But not knowing how to get Jules back. He conveniently starts running into her… but she refuses to give him the time of day!! Holding onto to her anger as he continues to barge into her life… He seems different, so desperate. Trying every thing to get her back or just get her forgiveness. (You will also have a love/hate relationship with Dylan.) How can she ever trust him? Why now? Just when she was getting her life back on track with a wonderful man. Should she start fresh with Austin and totally walk away from Dylan?? Can she turn off her feelings for him? I was plague with all those questions and more…. My head was reeling after I read this book. I can not wait to read the next book, Jealousy. Just the name alone has me needing more!! We shared a love that regulated every heartbeat and every breath we took. It was all encompassing. I thought our love could withstand time and anything thrown our way. I was wrong. So wrong. Jealousy is a perfect name for this book…. Remorse and denial would work also! Since that seems to be the theme throughout. This is the second book in the From The Inside Out Series. We get more Jules, Austin and Dylan. It’s an epic love triangle. That will have your stomach in knots. Your heart and mind will be flip flopping back and forth…. From the beginning till the end, I was utterly confused and torn between Austin and Dylan. Two men determined to win Jules heart. Austin is her current boyfriend but she is in complete denial with her feelings for Dylan. She thinks he is the past and Austin is her future. But how can she look to the future, when she hasn’t let go of her past?? When her heart belongs to the other person…. I was Team Austin till I read this book. I soooo wanted to hate Dylan but it was nearly impossible with him acting like a love sick puppy. He was so remorseful and sincere. I would hate to be in Jules’ shoes trying gravely to be strong! But how can she stay true to her resolve when Dylan is finally telling her everything, she always wanted to hear?? Can she forgive him and believe his words??? If she could just forget Dylan and go off into the sunset with Austin. Her life would be so much easier. On paper Austin is the better man. He is a much safer choice. He’s patient and loving. He wants to take their relationship to the next level. She knows she can have a good life with him…..What is a girl to do?? In Jealousy you get to see a different side to Dylan. He really opens up. The dual POVs is excellent and gives you both sides of their story. Therefore you begin to sympathize with Dylan and see his true intentions. It all comes down to forgiveness…. How many of us would be strong enough to walk away? For the next book, I love that we get to choose our ending with the guy of our choice. I haven’t fully committed to my team yet …Team Austin or Team Dylan…. But I’m left needing to read more from Dylan first. He really tugged at my heart…….looking forward to more!!! S.L. Scott is a former high-tech account manager with a journalism degree pursuing her passion for telling stories. She spends her days escaping into her characters and letting them lead her on their adventures. Live music shows, harvesting jalapenos and eating homemade guacamole are her obsessions she calls hobbies.Scott lives in the beautiful Texas hill country of Austin with her husband, two young sons, two Papillons and a bowl full of Sea Monkeys. Her novels include Naturally, Charlie, Good Vibrations, and A Prior Engagement.She welcomes your notes at sl@slscottauthor.com.